The famous Bhagavan Sri Ram Temple at Lodhi Road in New Delhi, India, is noted for its South Indian temple architecture style. The main murti worshipped in the Sri Ram Mandir is in the form of Sri Rama Pattabhishekam – Coronation of Bhagavan Sri Ram. Thus the sanctum has murtis of Bhagavan Sri Ram, Mata Sita, His three brothers – Bharata, Lakshman, Shatrughna – and Hanuman. The temple is maintained by South Indians. When the site was dug for temple in 1968, a small murti of Goddess Lakshmi was discovered from here. Initially, the temple only had a photo of Bhagavan Sri Ram in the sanctum. Later murtis of Sri Ram, Mata Sita and Lakshman were consecrated. 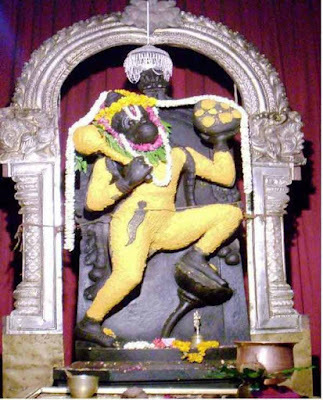 The temple attained fame and popularity after the installation of a 12-feet Lord Hanuman sculpture in 1970s. Lord Ranganatha form of Vishnu – Srihari Vishnu reclines on Ananthasesha and the murti is a replica of the murti worshipped in the famous Srirangam Temple in Tamil Nadu. Sri Ramanujacharya sits at the feet of the murti. Lord Venkateshwara of Tirumala Tirupati with Padmavati. During winter season the temple closes early in the evening at 8:30 PM.